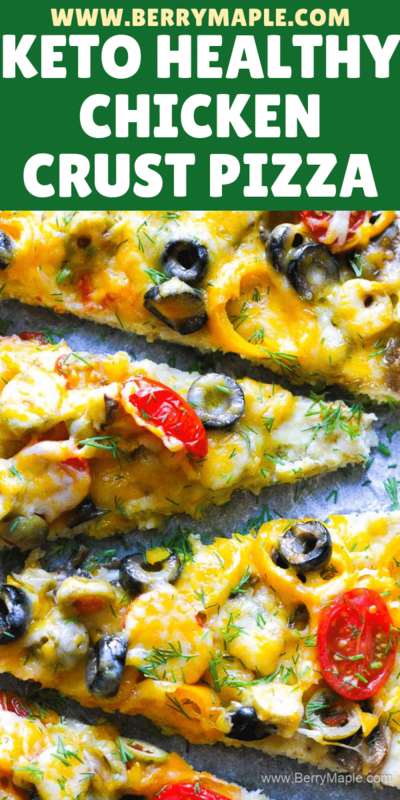 Low carb keto easy and delicious chicken crust pizza topped with veggies! Made with ground chicken, shredded cheese and veggies, it will quickly become your family favorite. 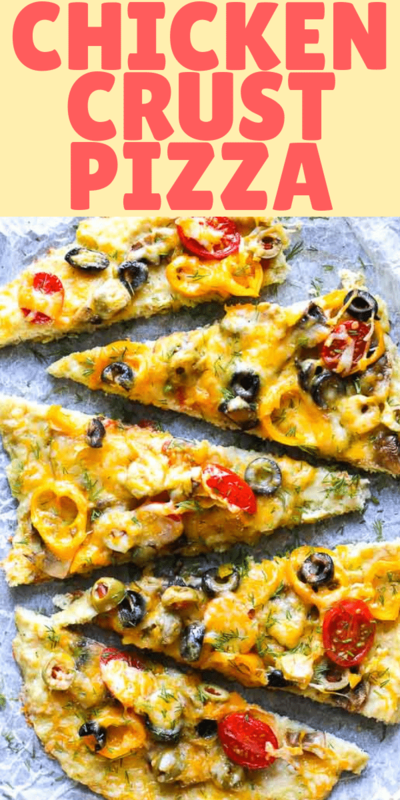 Delicious, low carb chicken crust- eat pizza at any time of the day without guilt but with all that flavors that real pizza brings. Use food processor to grind the chicken. Mix ground chicken with an egg and add spices of choice. And salt! Spread the chicken dough on the surface and bake at 375F for 15 minutes and then another 15 minutes after you put on toppings. 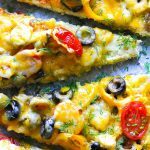 For keto or low carb pizza you also can use cauliflower crust. Its easy to make and i will post the recipe for that very soon. I also saw they sell it in Costco! 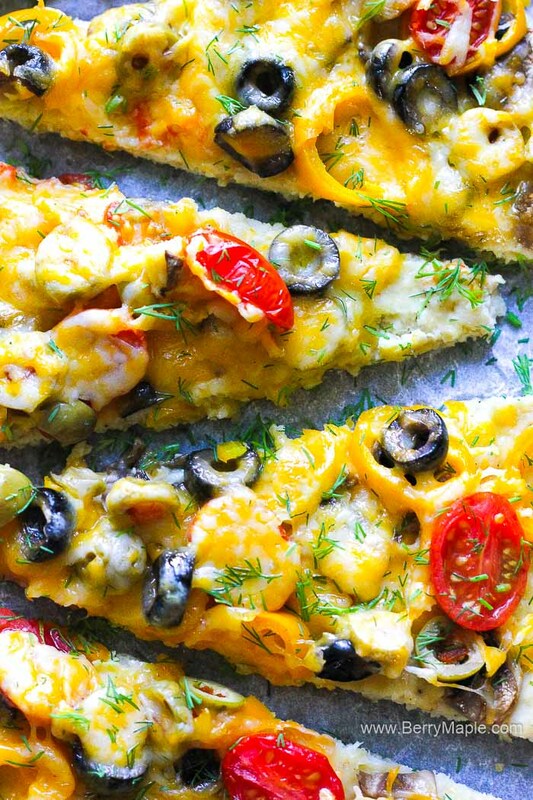 What ingredients you use for chicken crust veggie pizza? Can i freeze chicken crust pizza? You can absolutely do that and use frozen chicken crust. You can put it right on a parchment paper before freezer, so when you will decide to cook it, just put in in the oven! I don’t recommend freezing pizza with toppings already put on, because it takes twice longer for crust to cook, then for veggies and cheese. Thank you for reading and trying my recipes. Your opinion is very important for me! Please leave a comment below if you made this dish! Also tag me and follow on INSTAGRAM at @myberrymaple . Make the dough. Grind chicken breast in the food processor, transfer to a bowl, add egg, salt and mix well. Meanwhile cut all your veggies. Add more or less, depend on your liking. Take the dough from the oven. Sprinkle with veggies and shredded cheese and put back in the oven for another 15 minutes. Done! How thick do you spread the chicken crust and about how many inches is the diameter? Hi! Not a silly question at all! :) Dont precook the chicken. Bake it once without toppings and then again with toppings, according to the instructions. This looks fantastic! I’ve tried several different versions of cauliflower or other alternative crusts and have yet to be impressed. Can’t wait to give this a try!!! What a great idea using chicken as the crust. You can do so much with this! Wow! What an interesting recipe! I bet it was delicious and love that you can eat a low carb diet and still enjoy this treat! yum, thanks for sharing! I’ve never even thought about doing chicken as a base! Perfect for my fam as we are GF. 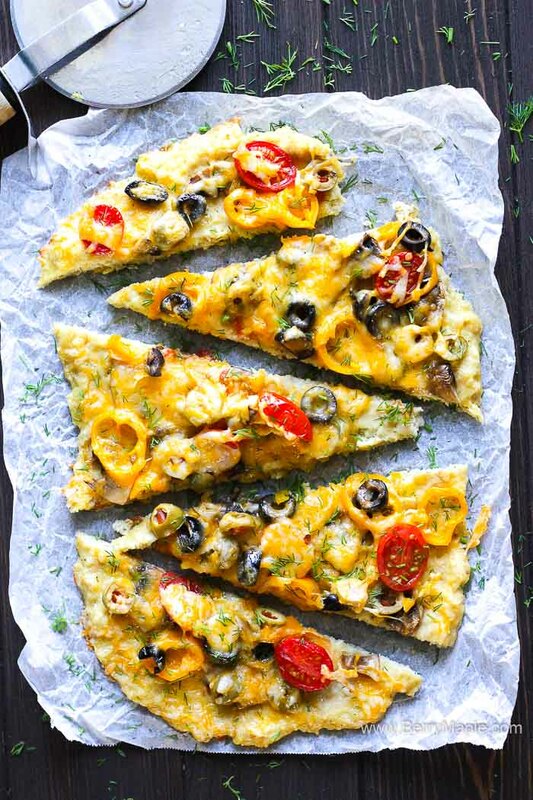 I’m always looking for tasty low carb recipes and this one looks delish! Can’t wait to try!